We began as a Zablocki Veterans Administration Medical Center recreation program in 1985. Through the years the program grew until, in 1996 with the support of Marquette Medical Systems Foundation, we established SEWASP, a unique community based organization. In 1998 we incorporated in the State of Wisconsin and became a chapter of Disabled Sports USA. SEWASP is a not-for-profit 501c(3) non-stock corporation licensed in Wisconsin as a charitable organization and is a chapter of Disabled Sports USA. We rely on contributions to support all functions of our ski school. Our mission is carried out with an all-volunteer board of directors and volunteer ski/snowboard instructors. "Adaptive" refers to the modified equipment and teaching techniques used to enable skiers and snowboarders to participate safely and as independently as possible. 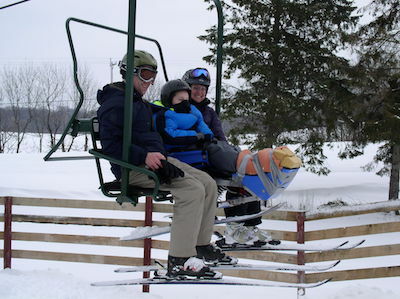 Instruction is generally provided at Alpine Valley Ski Resort near East Troy, Wisconsin (southwest of Milwaukee on I-43), on Thursday evenings from January through mid-March. The program provides adaptive ski equipment and equipment fitting. Equipment provided includes bi-skis and mono-skis for participants who may sit down when they ski. Some skiers have their own equipment.